Cut tiles to the right size and shape using a wet tile saw. Set up the wet saw and attach it to a water source if called for. Mark the desired shape and size on the tile. Push the tile against the rotating carbide blade of the saw to make a straight cut. For curved cuts, make straight incisions at right angles along the desired curve. Snap off the resulting 'fingers' and finish the curve with a diamond file. Fill the space intentionally created to allow for expansion or contraction of the construction materials with a sealant such as silicone. Use grout, silicone paste, mastic or other appropriate material to fill the joints between tiles. 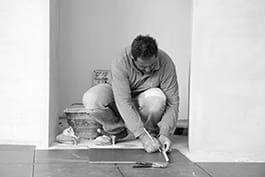 Spread the mixture onto the tiles using a padded trowel or float. Make sure the mixture is worked into the joints before removing excess material. Use a diagonal motion to avoid scooping material from the joints. Wash material from the front of the tiles and buff the tiles to finish. Firmly place the tiles on a surface prepared with adhesive. Adjust their position to so they are flush and evenly spaced. Take care not to disturb the surface. Insert spacers in the joints. When working vertically with heavy tiles, place a supporting piece of timber to prevent slippage if called for. Remove any excess adhesive from the face of the tile. Apply the tile adhesive, often thinset, to the surface. Load the notch trowel with adhesive and paste it to the wall to form a thin, even layer. Take the drying time of the material and your working speed into account to make sure the adhesive does not dry out. Remove excess adhesive. Apply silicone or mastic along the edges, anywhere slight movement is expected, or for improved moisture resistance.